Sushi platters are a work of art, a tradition breathing through the best food ingredients and a delicate combination of flavors. Talking of ingredients, it is the freshest of fish imparting the best flavors, though I am yet to have an absolutely fresh slice of tuna or Salmon in my sushi. 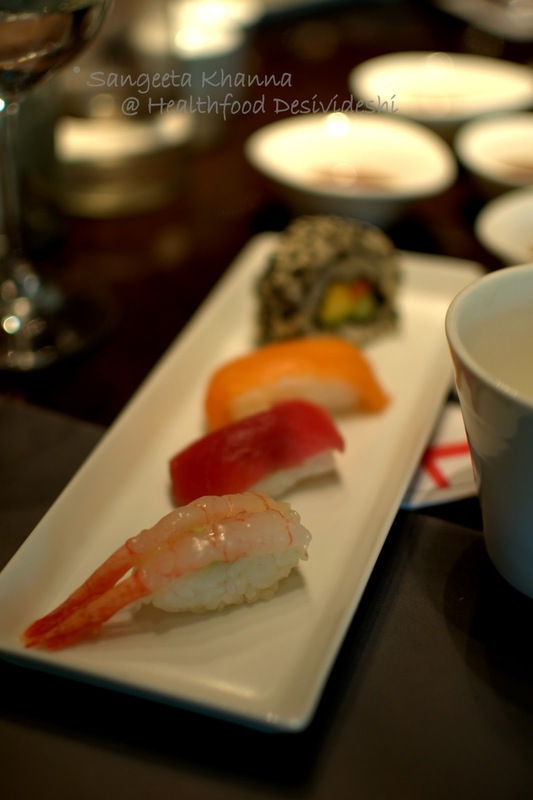 For Japanese, sushi was a way to use up the fish in plenty, fresh or otherwise. Yes, they even fermented the fish to be used in sushi and other dishes, Japanese have always been pescatarians (fish eaters) and like all meat and fish dependent populations, they have been preserving, pickling, curing and fermenting their produce for ever. Sushi was and still is to an extent, made with fermented fish and that I know is a great food tradition. Fermentation of a few foods is great help for meat and fish eaters. But what we are exposed to in our world, is actually fresh fish sushi, if frozen in considered fresh for places like Delhi. Fresh fish should smell like sea they say, a fish shouldn't smell fishy. The freshest of sea fish go into Sushi and Sashimi and you can taste the sea in it. And not only the fish, I find the accompaniments of Sushi as refreshing and recharging as the subtle flavors and the burst of wasabi on the palate is something that wakes up the senses. The umami flavors lingers on. I was at The One, Le Meridien yesterday for lunch. 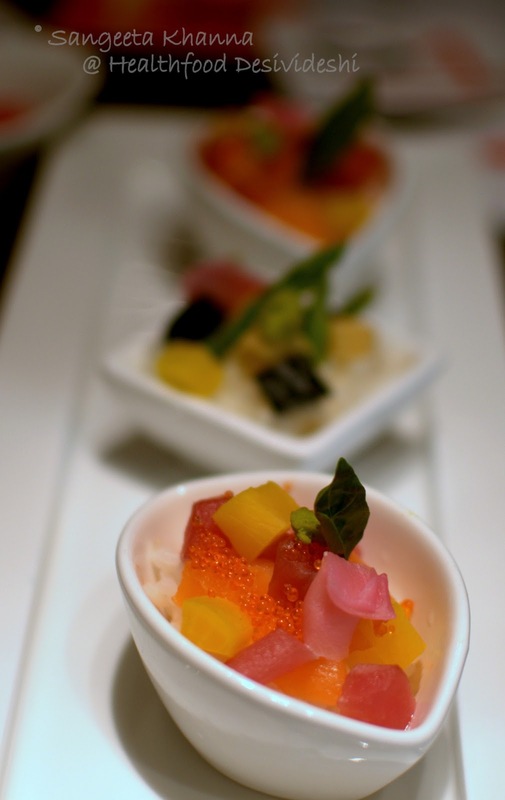 where Japanese master chef Masahiko Saito is currently displaying his Sushi art and skills. He works at The Westin Tokyo. 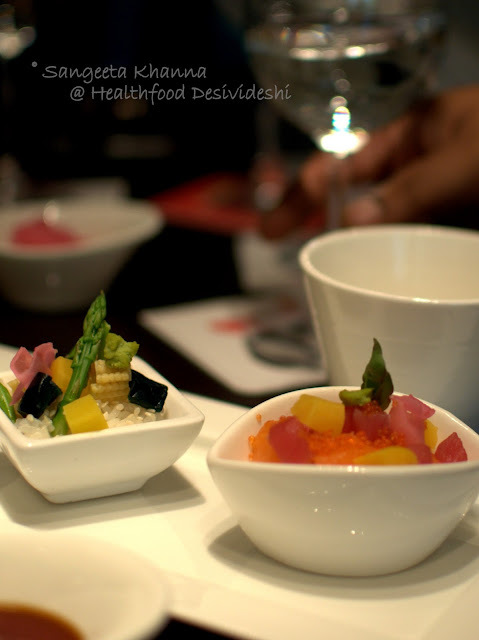 I joined Anasuya Basu, Director of Marketing and Communications, Le Meridien and Pushpesh Pant, the noted food critic and historian and another blogger Alok Wadhwa for this sushi demonstration. 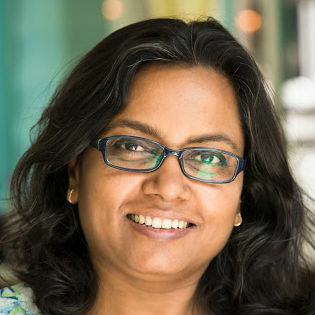 Our translator interpreter was Vedangi Ambekar who duly communicated our numerous queries to Chef Saito and brought the answers back. 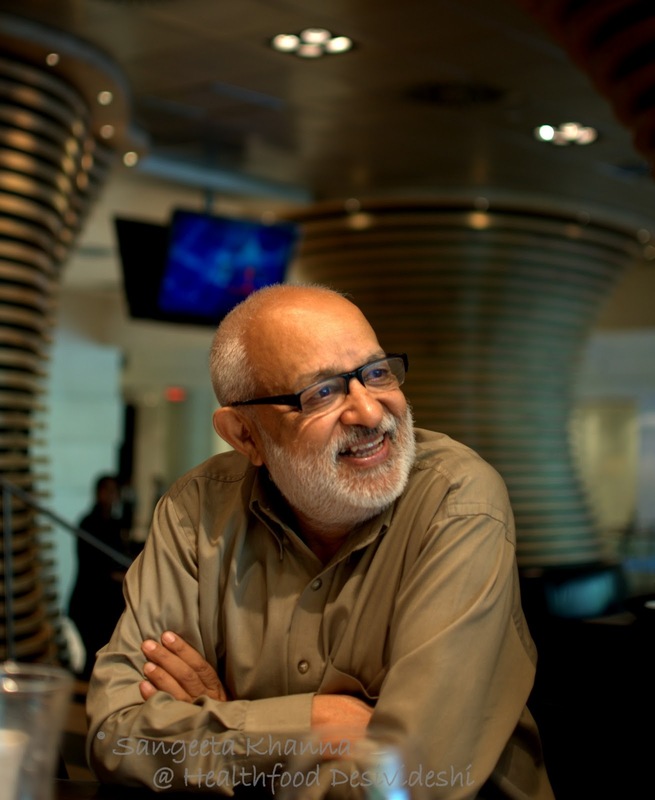 Meeting Mr. Pushpesh Pant was a delight as I have admired his work and knowledge for long. He was disappointed when Sake was served chilled in wine glasses. Chef Saito was glad to see someone wanting warm Sake served in cups. He did get up and went to bring warm Sake in a slim carafe and served it warm, it was a whole different world from the chilled, temperature arrested aroma of Sake in wine glass. 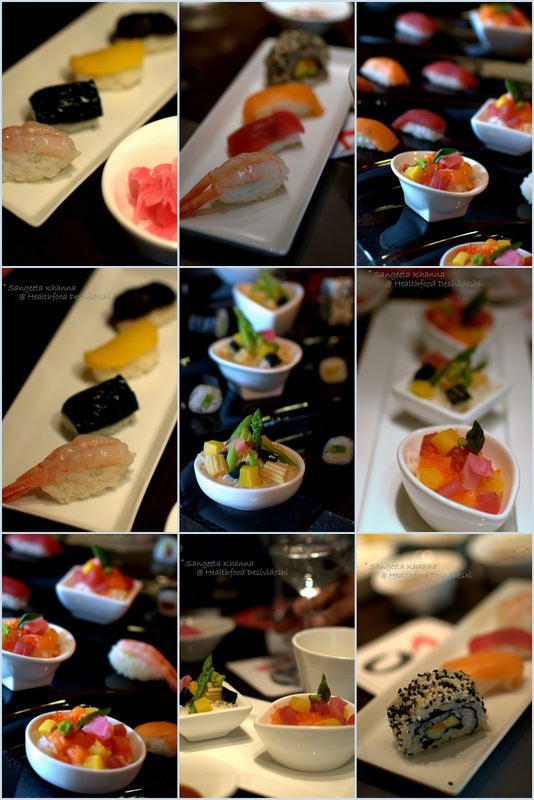 Our beginning was perfect, by then we had already asked Chef Saito everything we wanted. Chef Saito is a very pleasing personality, smiling a lot, nodding a lot and even clicking a picture of us. You can see how he transforms into a different avatar once he is with his craft. Focusing almost like a magician, as if he is about to cast a spell. 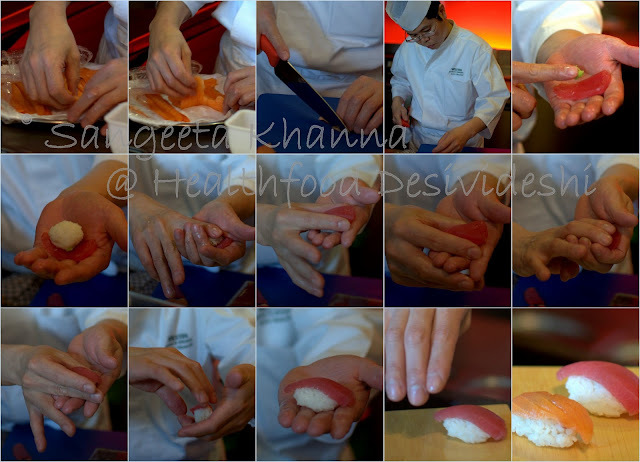 He prepared different types of Sushi for us, demonstrated how it is done in steps, I was mesmerized by the deft fingers. See how he takes a thin fillet of fish, cuts neat pieces for making Nigiri-zushi of salmon and tuna and then rolls up an oval ball of sticky rice (called Shari), dots the fish with wasabi and then places the ball of sticky rice over it. And then a few deft movements of fingers shape the Nigiri perfectly. 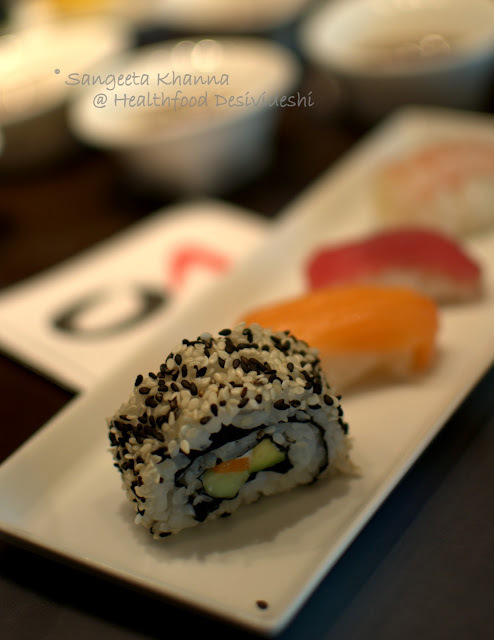 Not only the sushi with fish and shrimps, I loved the vegetarian sushi more I would say. This pickled aubergine and pickled mooli was a huge surprise. Pickled mooli was a very known flavor and I am going to try pickled aubergine really soon. I am smitten but he good thing is, those long green aubergines are growing in the garden right now. The Shiitake mushroom nigiri-zushi was a delight as expected. Pickled or vinegar cured shiitake is a delight to have. Those delicate petals of ginger slices pickled pink are such an addiction. 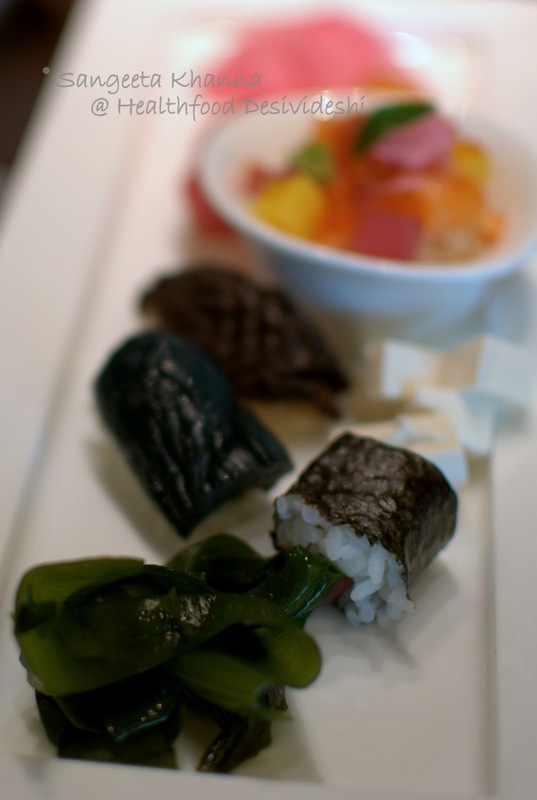 And I loved Wakame, the seaweed which was rehydrated, I can imagine how it would taste fresh. Lots of wakame and some silken tofu in the miso soup was perfection. You would know why Umami is such an addictive flavor. And you should know why it should come from natural whole foods rather than chemicals. What better than fish and seaweed? A generous helping of wasabi in between will help you enjoy the other flavors well. By generous I mean a lentil sized dot if it is wasabi for me. Though I can have several helpings repeatedly, but very little at a time. 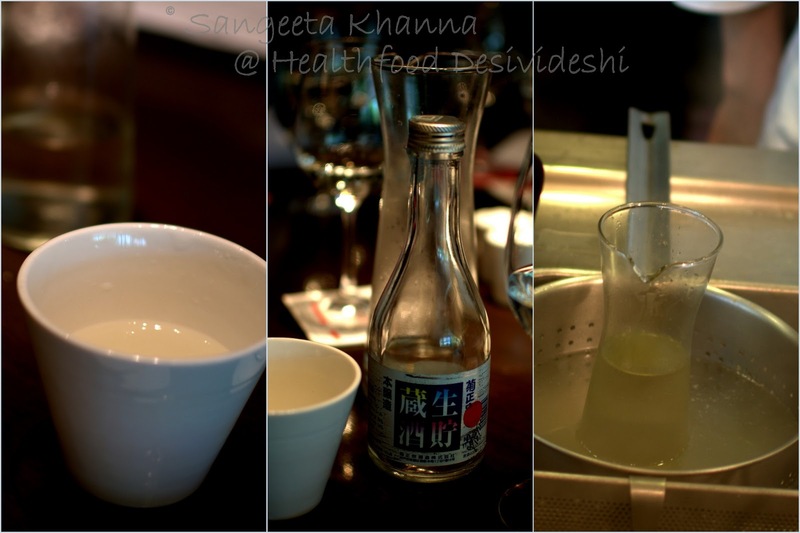 Warm sake was served again, I saw Chef Saito was heating sake in double boiler. The Chirashizushi is the scattered sushi that is the easiest to make and serve at home. 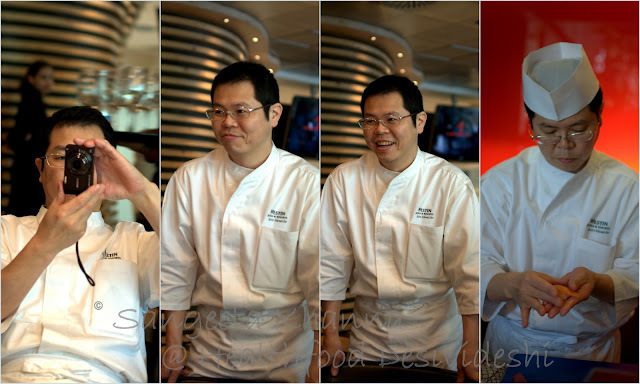 Chef Saito gestured (he does not speak English) that Chirashizushi can be eaten with a spoon as well. I was already doing that, can't eat my rice with chopsticks. Fresh vegetables, pickled ginger, bits of pickled mooli, aubergine and shiitake, a very interesting trail of flavors, it needs a dash of soy sauce and a peck of wasabi too. Partners in sushi sin. The fish chirashizushi had a sprinkling of salmon roe and that lends it a different burst of textures and flavors. I just had one query I wish I had asked Chef Saito, it slipped off my mind when we started talking about our own regional foods with Pushpesh Pant. One of the chirashizushi had a garnish of a tiny basil leaf and it spoiled the sushi for me though I love my basil. I would have asked him if sweet basil goes well with umami. Uramaki or the California roll, an inverted sushi where the nori sheet is inside and the rice on the outside was an absolute delight as well. Sesame is my love and it goes so well with leathery nori inside and that small piece of avocado in the center. 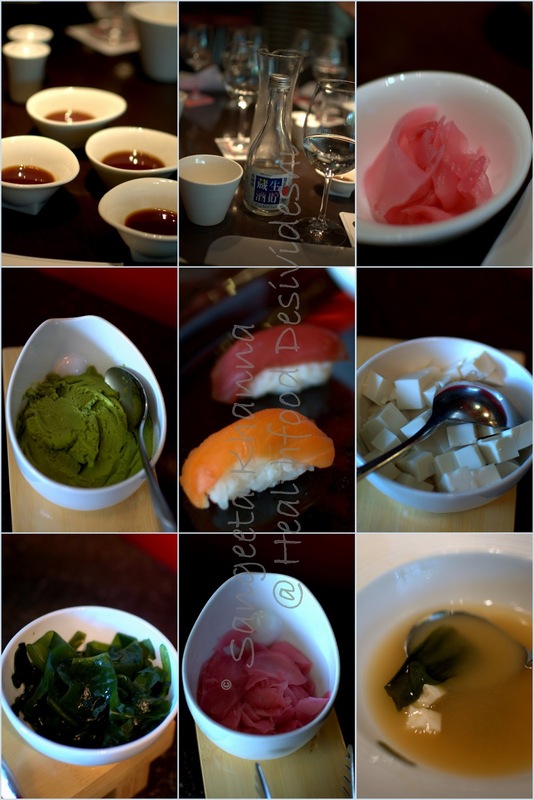 This was the best educative sushi meal ever. I asked a lot of questions about how soybeans are a pat of Japanese home cooking and chef answered everything patiently, even if it was not about sushi as I wanted to know about home cooking in Japan too. We indulged in some salads from the buffet spread after the sushi. I liked the pineapple salad the most with herb dressing. Good fresh ingredients are a key to great taste and I experienced it at The one. Sushi is a part of the buffet at The one and can be ordered a la carte at Nero. Assorted platter with 10 sushi costs from 1000 to 1200 INR at Nero and the other sushi are priced from 650 to 795 for a platter of six. The One sushi menu has the assorted sushi platter and it is also a part of the buffet menu along with the flavorful miso soup. Don't miss the miso soup with a generous helping of wakame. 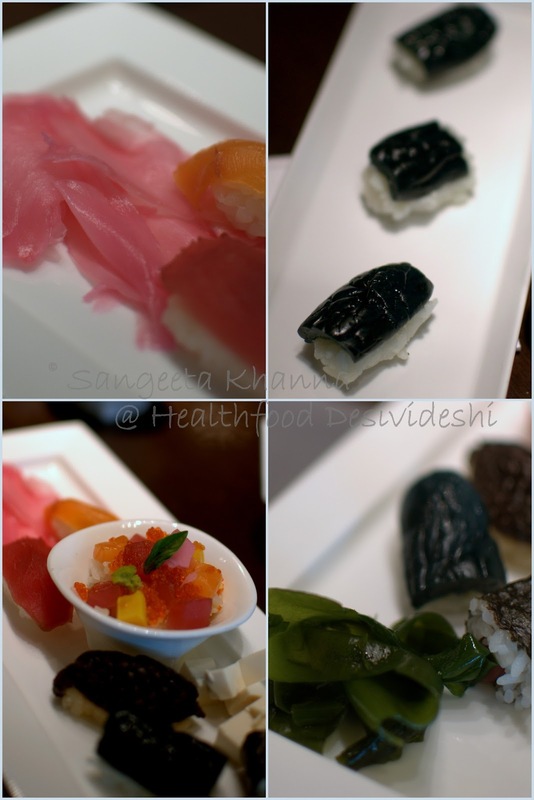 The sushi festival is on till 21st of April, I hope Le Meridien includes these sushi in their regular menu as well. Such a centrally located hotel should have everything the people are looking for. 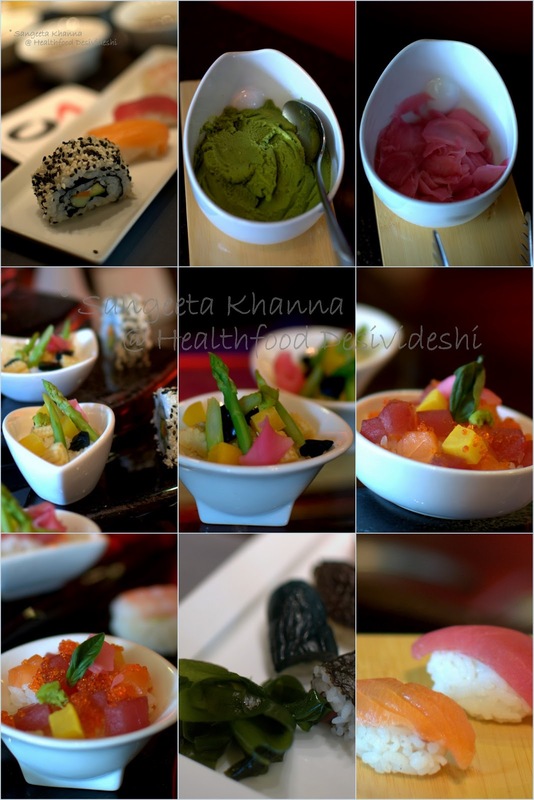 And I feel people of Delhi are going Gung ho about sushi now more than ever. I loved this post ! I love my sushi and your description of the various types brought so many lovely memories back ! This is one event I would have loved ! This sushi looks so fresh! you definitely dont see that every day! Yum! Sushi is a beautiful thing. What an awesome experience!